The popular business woman and Chancellor of Osun State University, Dr. (Mrs) Folorunsho Alakija has explained that she donated a teaching hospital to Osun State University because of her love for children, mothers and humanity and for the advancement of medical education. Alakija said the idea of the teaching hospital was well-thought-out particularly as the university has been given approval to recommence its medical school. 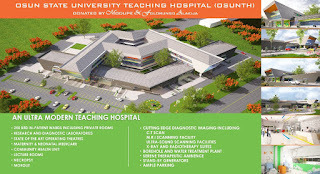 She commended the people of Osogbo for donating a 30-acre piece of land for Osun State University Teaching Hospital. 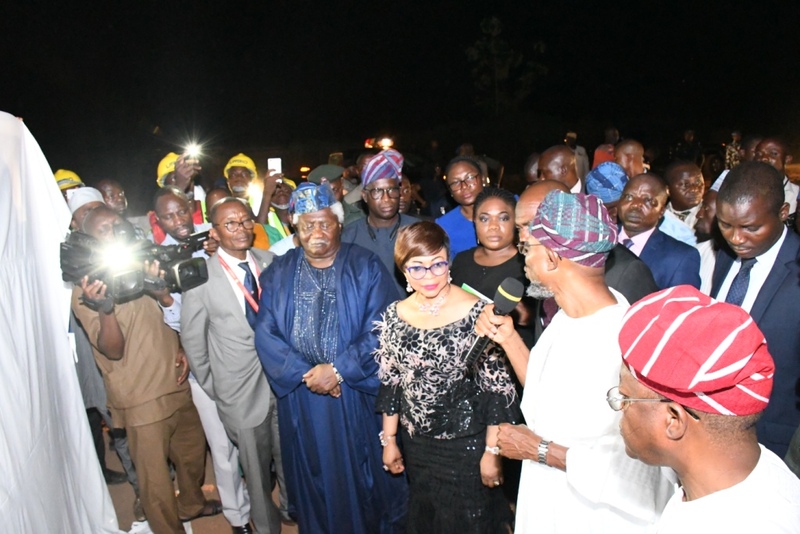 The Chancellor and her husband also commended the tenacity and dynamic driving force of the Vice Chancellor, Professor Labode Popoola, who has continued to work hard in his rebuilding and restoration agenda at the university. 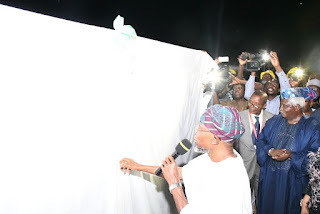 Before he completed his tenure as the Governor of the state, Mr Rauf Adesoji Aregbesola ensured that he laid the foundation for the 250 bed Osun State University Teaching Hospital (UNIOSUNTH) on Thursday, 22nd of November 2018 in Osogbo , the state capital. 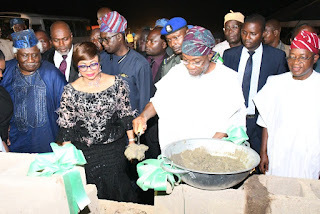 The foundation laying ceremony was witnessed by Aregbesola's successor, Alhaji Isiaka Gboyega Oyetola and the Chancellor of the university, Dr. (Mrs) Folorunsho Alakija who was accompanied by her husband Mr. Modupe Alakija. While laying the foundation, Aregbesola said "this project gives me so much joy. Few years ago, I had to stop and suspend the medical program of this university because of the inability to even do any skeletal practicals due to lack of clinical facility, my intention then was to provide a befitting medical and clinical facilities which requires a huge amount of money". "To the glory of God and delivery of quality medical education, the foundation stone of Osun State University Teaching Hospital (UNIOSUNTH) donated by Modupe and Folorunso Alakija is laid today 22nd day of November, 2018", Aregbesola said. Aregbesola also extolled Prince (Engineer) Tunde Ponnle for his bequeathal of his property in Ada for Medical Training and outreach to the university. The Vice Chancellor of Osun State University, (UNIOSUN), Osogbo, Professor Labode Popoola assured that with the the 250-bed UNIOSUN Teaching Hospital, the institution is on tract to produce world-class medical doctors. At inception in 2007, UNIOSUN commenced the MBBS programme and the programme was granted full accreditation by National Universities Commission (NUC). Professor Popoola said the Senate and Governing Council of the University have approved the process of re-accreditation of the Medical and Dental Council’s (MDCN) programme. He noted that the decision to recommence the MBBS programme is based the need for the university to play a significant role in the training of Medical Doctors in Nigeria. Popoola said considering the importance of the programme and the need to demonstrate the continued relevance of the university to the society, the university authority considered it a challenge to proceed with the process of getting the programme back on tract. 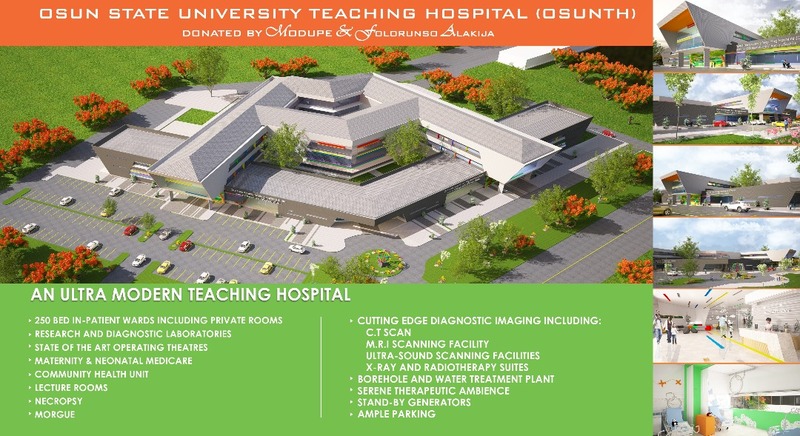 "When completed, UNIOSUNTH will consist of a Community Health Unit, Maternity & Neonatal Medicare, Research and Diagnostic Laboratories, State of the art operating Theatres, Cutting edge Diagnostic Imaging, inclusive of C.T Scan, M.R.I Scanning Facility, Ultra-Sound Scanning Facilities, X-ray and Radiotherapy Suites, Lecture rooms, Necropsy and Morgue", he said. The 3-D image of the project was unveiled by the Chancellor of the university, Dr. (Mrs) Folorunsho Alakija who was supported by her husband Mr. Modupe Alakija. The couple donated the facility to the university. Prof Popoola praised the philanthropic spirits of the Chancellor who pledged to build and furnish the 250-bed Uniosun Teaching Hospital at Oke Bale located along Ibokun road in Osogbo.